Specials, Specials, Specials.. and all by PurpleMoon!!! A wonderful short pencil skirt covers the legs down to the knees. The waist part is decorated with a wonderful prim that imagines a down jacket part. The top is wonderful detailed with a white shirt under a black jacket and on top you have that wonderful prim cape that covers the shoulders and goes down to the elbows. The neckpart shows off a light color part with the amazing filigree feather-looking prims. A totally eye catcher is that amazing huge hat in a lightly vintage style. Over all a dress that definitely turns heads and a wonderful contribution to this special show! The second special will be presented on the Model Convention 2010 tomorrow during the PurpleMoon show. The Model convention is running for nearly a week now and it seems great sucess..nearly everyday the sim is filled up and informative workshops and lovely fashion shows go hand in hand. 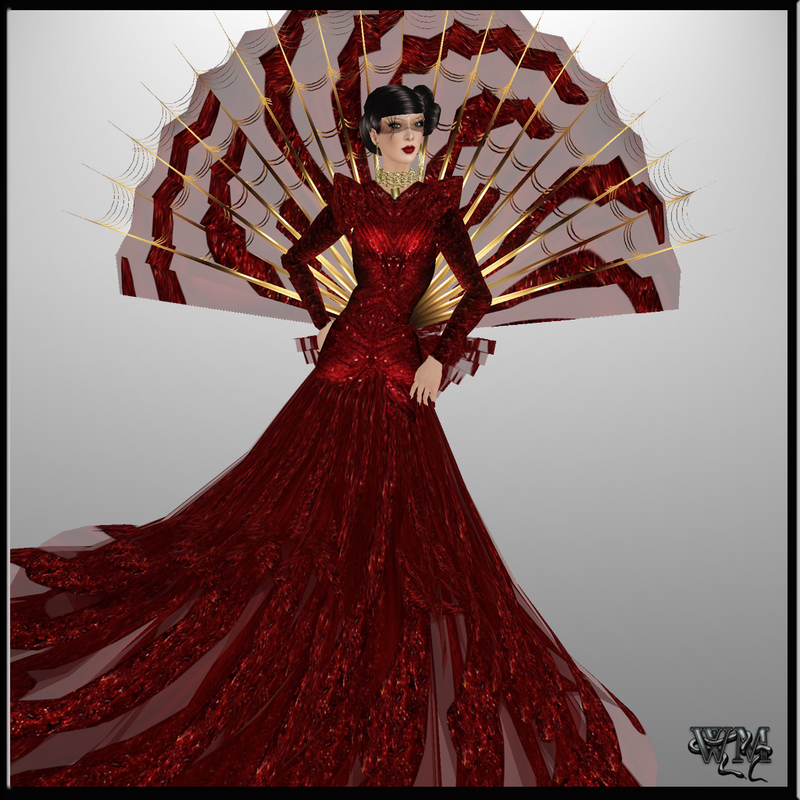 Tomorrow for the great ending there will be a runway show showcasing the amazing designs of PurpleMoon. Poulet Koenkamp designed an outfit especially for this show and I had the great honor to be on the vendor picture. 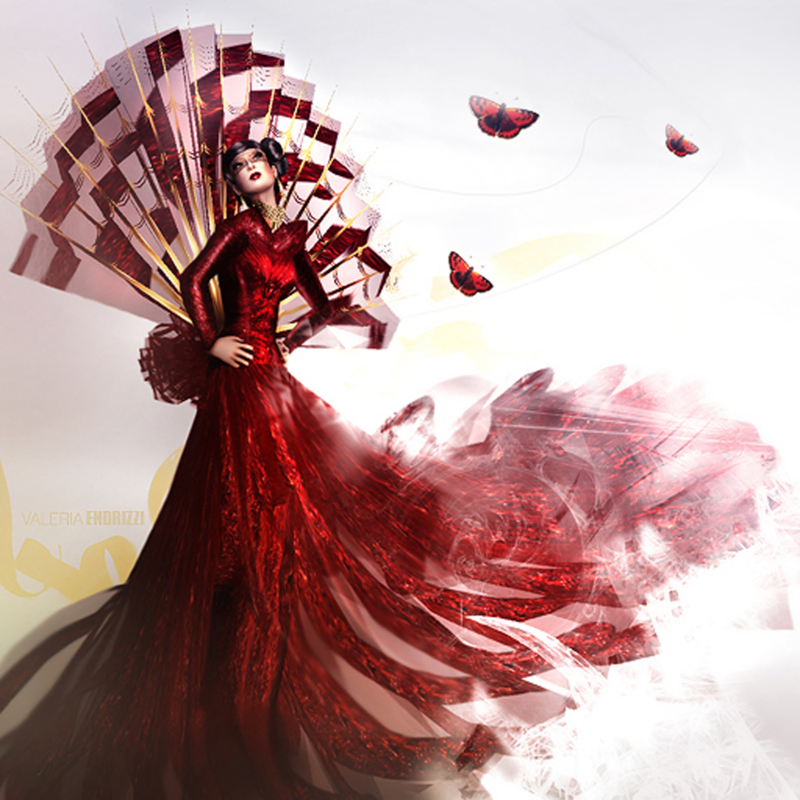 A breath-taking extravagant gown called “Corina” will be the special release for the show on the Model Convention 2010 tomorrow, sunday the 26th of september at 4PM SLT. The long and elegant gown starts at the top with a very tight shape down to the waist. There the huge skirt starts that moves dreamy with every step you take. The aerial kind of design really let you feel like a princes walking on clouds. 2 prim attachments decorate the shoulders and underline the sophisticated touch. What definitely gets a lot of the view will be the grand back part that gives a light asian touch. 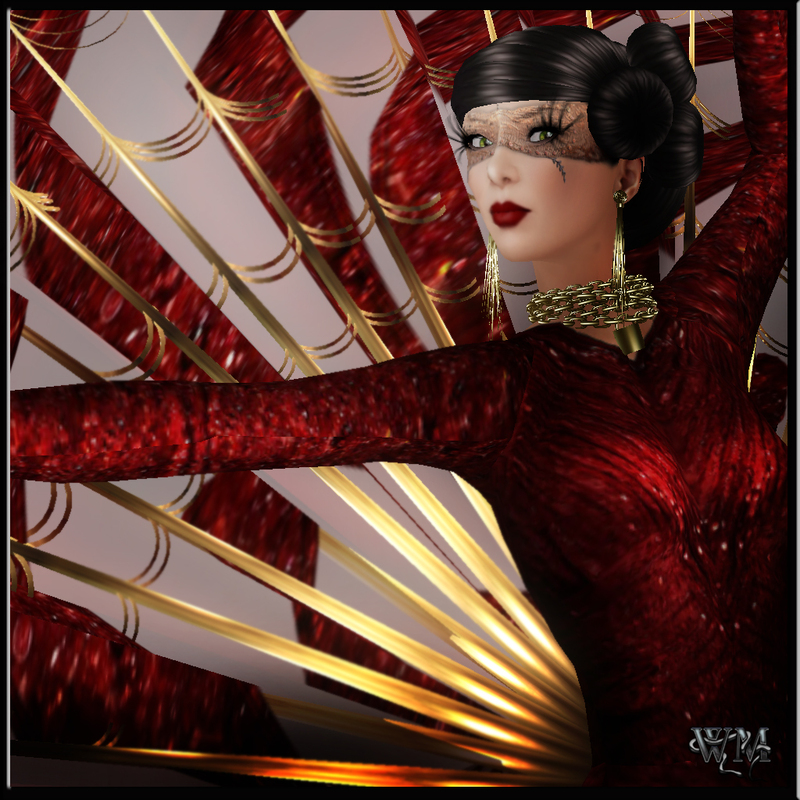 The long golden spikes hold a wonderful back fan of lace and red texture. The red texture has a wonderful pattern and repeats the one of the dress perfect. Perfect to that gown Poulet Koenkamp designed a hairstyle named “Zoe” her shown in ebony. With the sweet knots on the eft side it definitely adds a very high-class touch to the whole outfit. This entry was posted in Fashion, New Releases and tagged Arisia Ashmoot, Baiastice, Best of SL, Black, Blog, Blogger, Body Talking, BOSL, BOSL Fashion Week 2010, Boulevard Agency, Clothing, Designer, Fashion, Female Clothing, Gold, Gown, Hair, Hat, High Heels, House of Fox, Jewelry, Latest Release, metaverse, Metavirtual, Model, Model Convention 2010, Modeling, New, New Release, Pencil Skirt, photographer, Pose, Poses, Poulet Koenkamp, Pre Release, Preview, Pumps, PurpleMoon, red, Second Life, Secondlife, Skin, Skirt, SL, SL Clothing, SL Fashion, SL Fashion Week, Sneak Preview, spikes, stiletto, Stiletto Moody, Style, Tribute, Virtual World, Wicca Merlin, Workshops. Bookmark the permalink. ← Unbelievable!!! Sale at Stiletto Moody!! !